Gili Trawangan is located off the northwest coast of Lombok, Indonesia. Gili Trawangan, known as Gili T is the largest of the three famous Gili islands of Lombok. ‘Gili’ means small island in Sasak, the native of the island of Lombok. Trawangan comes from the Bahasa Indonesia; Terowongan (Tunnel), due to the presence of a cave tunnel built there during Japanese occupation in World War II. 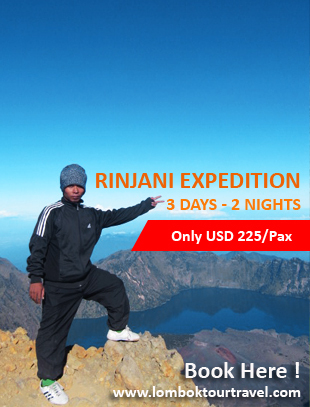 It has many attractions of nature with an unspoiled scenery for nature lovers. It offers an entertaining experience for who want to enjoy the beautiful island paradise with a great feasibility up tp 40-50 meters. The underwater scenery will can satisfy you to explore the underwater nature in Gili Trawangan. Gili Trawangan Indonesia is one of the only two places that have this kind of blue coral in the world in addition to the Caribbean sea Mexico. People who spend the night in Kuta can take shuttle bus to Padang Bai harbor. It is better to spend the night in padang Bai, actually. In Padang Bai, they can get fastboats ticket online or from the tour guides in Padang Bai at IDR 450.000 – 700.000 for 1.5 hours trips to Gili. You can also charter a day trip either on a fabulous sailing boats or speed boats instead public ferries in 5 hours crossing. 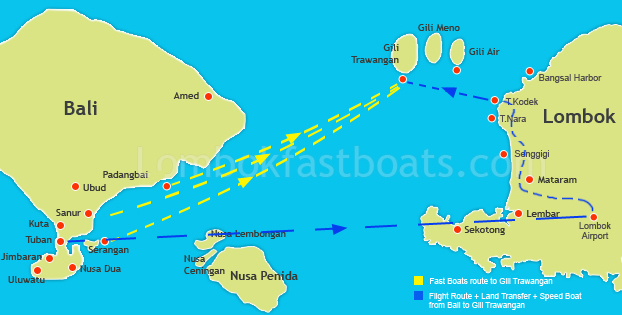 From Amed, it costs IDR 250.000 for each way for 45 minutes trips to Gili islands. Amed can be reached in 3 hours drive from Denpasar. Another way to get to Gili islands in style is charter a private helicopter, so you can see Bali and the three gili islands ( Gili Trawangan, Gili Meno and Gili Air) from above and enjoy to capture amazing photos of the islands. Air Bali, one og the air charter operator has Gilicopter, it flies on Friday and Sunday.